This page is a dedication towards my past team mates that I played with while touring the United States promoting the great game of softball. I feel that I was very fortunate to be part of this team and I just want to show the guys my appreciation. As you know the computer world is growing so fast and it is the easiest way to translate messages and e-mails and you can sell products on the Internet. I really like it because I can show off some of my teammates and tell you a little bit of what we were all about. Just a little tid bit about this photo of our team in the suits we called the Hitmen. The photo shoot was done in Tucson, Arizona in the back of some studio downtown and it took 9 hours to do the photo. It was funny because the room had wooden floors and just a plain white wall. It just goes to show you how computers have changed the world.. As you can see how the balls are all smashed into the walls. Those were the good old days.. The Silver Bullets were in existence for 3 years .1988, 1989, and in 1990. We were getting ready for our greatest year ever in 1991 when we had to stop the softball program for one year at Steele's because of business reasons. That was one of the hardest days in my life when I was told that we were not going to have a softball team. But life goes on and a year later Steele's was back with their softball program. Those 3 years as the Hitmen being called the Silver Bullets we rewrote the record books in more ways than one. I played ball in every State that there was except Alaska. During the period of 3 years that we working with Coors Light, Steele's had the opportunity to have a majority of the best ball players in the game play for them. Some of those players were Bruce Meade, Buddy Slater, Doug Brown, Ted Cox (former Major Leaguer), Cecil Whitehead, and many more. The photo above is the championship team in the Parma, Ohio USSSA NIT. Ron Parnell had a super tourney and took home all the awards. Nice job by the Rocket Man the 3rd. 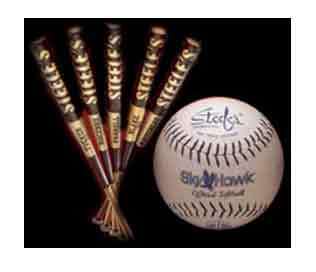 In 1987 Steele's lost the USSSA Major Men's World Series to Smythe Sox out of Houston, Texas. It was one of the most exciting games in the history of softball in my opinion. So when 1988 gets started and we are involved with the Coors Light people and proceeding to play our schedule, guess what happens to the Smythe Sox team? That's right. They fold their team right before the Smokey Mountain Classic. Now Smythe's team was loaded for bear also. We had played each other that year again a number of times before the break up. They were some heavy duty games. During the off season Coach Neale was able to lure Billy Blake from Smythe. 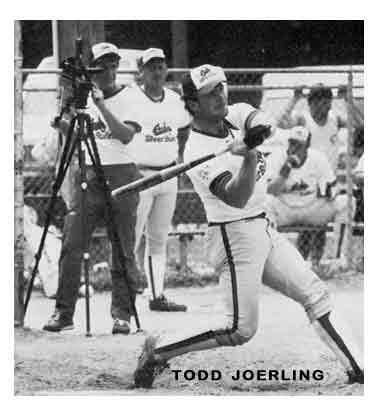 All he did was win the MVP award at the 1987 USSSA World Series series. He hit like .700 and set a record for RBI's that year with 37. So when Smythe breaks up it's a matter of who Coach neale thinks will help our team win. If you take a look at the photo from Las Vegas you will see that we had 17 players that made it to the photo shoot. Bruce Meade and Freddie Trice were the only ones that were not there for the Vegas shoot. We had enough players on that team to field two teams. Were traveling so much promoting the game that were taking turns with players staying at home and switching off during the week. It was a tough schedule but we got through it. 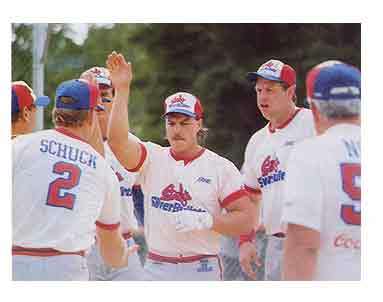 The photo at right is of Billy Blake getting a handshake after he hit the home run to beat Superior Appollo in the NSA Men's Major World Series. Another player that Dave picked up for the Silver Bullet years was Monstrous Monty Tucker. 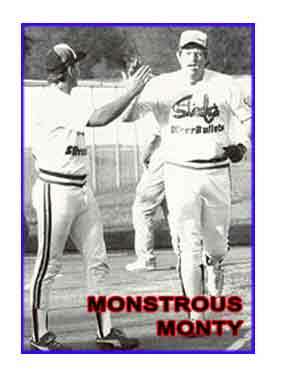 Big Monty had set the record for the USSSA Men's Major World Series for batting average when Dave first saw him. When ever the big man got real hot he was unstoppable. He put on a display in one tournament in Texas in 1989. It was the NSA Men's Major World Series. All he did was go 20 for 21 with 14 homeruns to capture the MVP award then. In 1990 Monty also helped propell the Hitmen to the ASA Men's Super title with an .800 batting average with 18 homeruns to go along with 32 rbi's. The thing about Monty was that he was always the team player. He would take the walk when given and if they shifted him he would take the base hit. He could hit the ball as far as anyone and just loved to play the game. During our days on the road, traveling from city to city we made our way up to Canada not once but numerous times. We traveled all the way up to the British of Columbia and played in the Vancouver Minor League baseball stadium. I remember it so well because Vancouver was such a clean city. It was totally awesome. I remember us having a home run derby there and the people were just stunned when they saw me hitting the balls out of their baseball stadium. I wasn't the only player hitting the balls out that night eighter. Big Scott Virkus was doing his share of damage to the softballs that night himself. He launched a couple to left center that might still be going. The night after the contest The very next morning we got up and got on a Cruise ship and went to the Island of Victoria. When we arrived at the ballpark in Victoria the people were waiting for us there.. We played there in front of crowds of 2 to 3 thousand people. They couldn't believe how far we were hitting the ball. On another occasion in 1990 we flew to Saskatoon, Saskatchewan to play a couple of exhibitions games with their All-Star team from Canada. They had invited us to be part of their Molsom Cup Challenge. We played two games in a baseball stadium comparable to a minor league stadium. The dimensions were 325 down the lines and 400 in centerfield. We played their all star twice but they were really no match for our team. We outscored them by a large number of runs both games. I think it was a great experience for the Canadians to see what big time softball was about back in the states. The next morning we were supposed to fly back to Chicago where they were waiting for us in our Silver Bullets vans. We have to spend the day at this airport in Canada. It was not bad enough that we had to get back on the plane and it was still not ready. You know Dave, he is raising hell with the Airport people. When we flew there we flew Air canada and everything was smooth. Dave who hates to fly anyways, now is thinking about renting a car and driving back. When I told him it was almost 1500 miles he changed his tune. especially driving thru Canada. Every team needs a leader and the Steele's Silver Bullets were led by two guys with the same desire, and that was to win. Below is a picture of myself with manager Dave Neale. We are both holding onto the championship trophy for the USSSA Super qualifier held in Cleveland, Ohio in 1990.. He really was the fire behind our team. He was the one that kept everything in focus. He was the one that was always pushing forward. Pushing forward towards the goals that he probably set for himself and our team and that was to win.. How could a ball player keep his mind focused all the time when you are traveling every day from city to city and not be with your family. I know that when Dave use to look for players he didn't always take the best softball player but he looked for the best athlete and then would turn that player into a great softball player. He would look for the all-around player.. What turned Dave on was when someone would say" Geez" look how fast that big guy can run, not how far he hit the ball. Neale was once asked if he could have the perfect softball team what would it be and his reply was Hey, we don't want to play you in softball we want to play you in football or basketball. He felt he could do that with the players he has had. In today's big time softball I see a number of teams with 5 sponsors and 2 coaches and somebody is keeping score. That is fine and there is nothing wrong with being organized in softball and having extra people. All I know is that our 1990 team was very unique in many different ways. One way in particular stands out. That is when we played we never had a coach. We had a general manager in Randy Gorell and our field manager was Dave. Here is the wild part. We didn't have base coaches like you have today. Who ever made last out of the inning got the bases the next inning. Sometimes Randy would coach third base and then who ever made last out would coach first base. What my point is , is that we did not need anybody to tell us what base to stop at or anything else really. Dave would just make the line up and he would just sit back and watch this well oiled machine just play ball day after day.. I honestly think that was one of the high points in my life. That incredible season of 1990. In 1990 we were trying to put together something that nobody had come close to putting together themselves... And that was to win all 4 sanctions of softball. I think that with one or two breaks we could have won the Big 4. But as time would tell we ended up winning the first three legs of the Grand Slam and got beat at the USSSA World Series. That is why I talk so much about team work and chemistry. I strongly feel that this is what separates the winners and the losers. With our team in 1990 we won 142 games in a row. I don't know if that record will ever be broken or not but it sure was fun being part of that team. 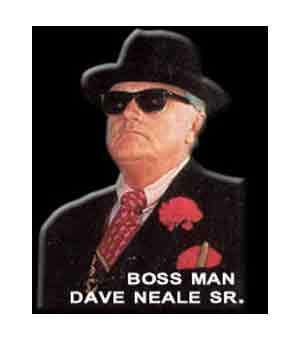 Dave Neale is so good at finding talent. As long as I have been in the game of softball I don't believe that their is a smarter man when it comes to making great ball players out of just players. He has a knack for it. I really think that he enjoys finding different players from all around the country. The one thing that always stood out about the man is that he never played favorites. There was never any of that buddy buddy stuff. If you were the better player then you were playing the game. I know now that style of coaching is what produced a number of championships. Below I have put in a photo of our whole team in 1990. Notice we just had Dave and Randy as coaches . 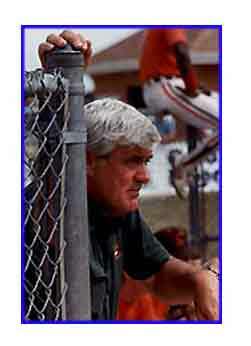 Terry Perryman was a player coach. But we really never looked at him that way. He was that good. Hell he was 46 when he was playing with us. He was unbelievable with the glove and flat out hit the stuff out of it. Terry played shortstop for the infamous Nelson Paints team out of Oklahoma that won the ASA Major world tournament back in 1977 at Parma, Ohio. How do you hit 844 home runs in one season? You hit nine home runs in one game, eight in a game twice, seven in a game five times, six nine times, five 24 times, four 43 times, three 76 times, two 72 times, and one 66 times. That's 844 home runs in 350 games. Actually, it's 844 home runs in 289 games. I actually went 52 games without a home run during my record setting season in 1987. Just to prove that the remarkable 1987 season was no fluke , I came back with 830 home runs in 365 games during the 1988 season. In 1987 when I set the single season record for home runs I always knew inside myself that I just happen to be in the right place at the right time. That is why I tried to do my best because I knew that if somebody else was givin the chance to do what I did I would hope they would do their best. I have seen a lot of great ball players come and go. I learned from a lot of the older players some things that I will carry with me for life. I always felt that if someone could have hit more than 844 Hr's in a season it would be Craig Elliott. I would have to say the Crusher next and then Joe Young. These guys never worried about the conditions of the field. When they showed up it was for the real deal. Craig and I used to say in 1987 "I feel the need for speed." On Sunday morning when Joe played he would say "hell it's Sunday you know I'm gonna hit." He was that good. Crusher didn't say much. He let his bat do the talking.. Every now and then he would holler at the ump "hey goof." He would be standing at third base with his long hair and sunglasses and you didn't know if he played with ZZ Top or was with the Hell's Angels. He was another very intimidating person. 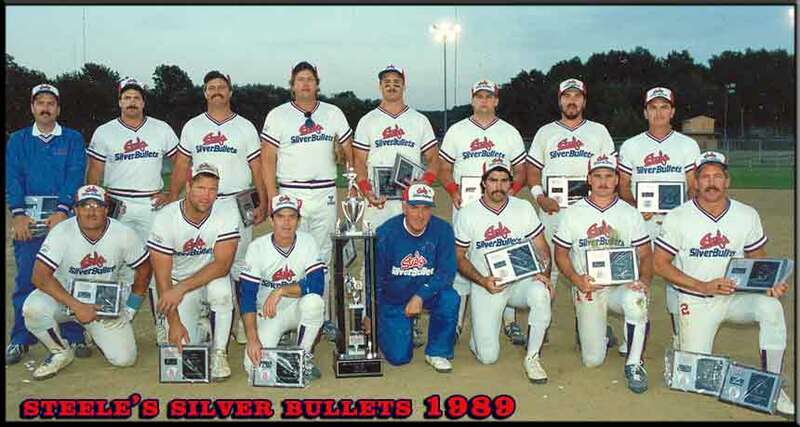 Here is a picture of my 1989 Steele's Silver Bullets team. This picture was taken in Las Vegas, Nevada at the Las Vegas Stars baseball field.. The picture was taken in January of 1989. I had rotator cuff surgery at the 1st of January. This was after we had won the USSSA world Series in Long Beach, California. Dave had put together the most awesome talent on one team of all time. Later that year we picked up Bruce Meade, Larry Fredieu, Doug Brown, and Little Buddy Slater. We had all the talent in the world, but we just could not get the job done. We won only one of the World tournaments for the year. We beat Superior for the championship of the NSA. Monty Tucker was the MVP selection. All he did was go 20 for 21 with 12 Home Runs and a .950 batting average. During our run for the ISA world championship we played almost unstoppable softball. Ron Parnell was on fire as he led the tournament in home runs with 17. Doug Roberson was tabbed for the defensive award along with being named All World. Joining Doug on the All World team was Scott Virkus, Craig Elliot, Jeff Stamps, Ron Parnell and myself. As the season of 1987 was winding down after the ISA and ASA victorys we once again set offensive standards and broke some of our own marks that we set the previous season. It was truly the greatest hours of Steele's. "Skyhawk up and Skyhawk gone!!! !